GC+You: Where Were You on 9/11? GC+You is a weekly blog contributed by GCU Dean of Students Tim Griffin and Student Development Director John-Paul Reiger. This week they hand over the duties to ASGCU Multicultural Director Matt Muchna. September 11, 2001, started as a normal day for me. I begrudgingly rolled over to my 7 a.m. alarm. I opened my closet and put on what I thought was a killer outfit. I then walked to the pantry and poured myself a bowl of cereal, just like thousands of other 10 year olds that day. I turned on the television to watch cartoons before anyone else could tell me otherwise. I quickly realized that this day would not be just an ordinary day. World Trade Center Memorial by Denise Gould. Over and over, broadcast stations played clips of two planes flying into the World Trade Center towers in New York City, as well as videos of the Pentagon in flames and pictures of a field in southern Pennsylvania were United Flight 93 was heroically brought down. As my family filed into the living room one by one that morning, everyone was silent. The images on the TV mesmerized each of us. The rest of that day went by as any other typical day. Except that everywhere I went people were either murmuring about the attacks or were oddly quiet. Going to the store that day with my mom I remember seeing some people who were panicking. Stocking up on food like it was Y2K. Other people were leaving work early, just because no one knew what else to do. I went to the local skate park and tried to drop down a ramp for the first time in my life. I fell and scraped both of my knees. I spent the remainder of my September 11 in front of the TV with bloody knees. I will never forget that day. In order to commemorate the ten-year anniversary of the September 11 attacks, I wanted to create a place for people to post their own unique stories and to remember the loss of life and the effect of that day upon our world today. I am interested to see if anyone was in New York City on that day, or if anyone had relatives that were in the city. Please post your own story below. Matt Muchna is a senior sociology major. He is the ASGCU Multicultural Director and part of the GCU cross-country team. He enjoys people, story telling and a friendly game of ping-pong. I remember that I had just lost my job the day before 09/11, and was sleeping in late when my daughter called me and woke me up saying “Mom! They’re bombing us”. I turned on the TV and watched the vidoes of the planes slamming into the WTC towers and I remember thinking “This is the end of the world”. Fortunately it wasn’t but it did change our world dramatically. Those first few days, I was glued to the TV wondering what was going to happen next. Like a lot of us, I still wonder daily when the next attack will happen. We are very fortunate, as a country, that we don’t face this kind of terrorism on a daily basis like so many other places do. I will never forget 9/11. As a previous New Yorker I morned with the people who had lost so much. In particular my heart went out to the police officers,fire fighters and other first responders. In the days after 9/11 I was called to Thunderbird Academy to help the staff design a critical incident program. I remember foreign students who were afraid they would be deported. In addition, I supported the Morgan Stanley group in Phoenix who took diverted calls from their building in the Trade Center. Many of these calls were from people looking for their loved ones. It was heart wrenching. When I came home at night I remember watching the F16 fighters circle the city and feeling grateful that our military was on the job protecting us. This weekend I watched many programs regarding 9/11. I was particularly inspired by the memorial and realized how important it will be to hope to find some closure there. September 11,2001 will always be a sad day for me. I was raised in the Bronx in New York City and I will never forget the hurt in my Heart when those planes hit the Twin Towers. My reaction was how can that happen? What about Family? Friends? I watched the TV in such a way that I could not believe what I seen. People running and crying. Then I get the worst news that I did not want to hear. A dear friend of mine who I went to high school with and was in my wedding was killed he was on the 95th floor and his last words to his wife was that they were all being led down the staircase to exit the building and then his phone went dead. He was never to come home again he died leaving behind 2 daughters and his wife and a life full of memories.Though he is gone the high school i went to built a memorial in his name so he is always a part of where he grew up and went to school. Many New York people suffered that day but they also united that day in Love. My husband and his father never had a close relationship. It was the typical English father/son relationship. His dad treated him much same way his own father had treated him. Stern, never a hug or an “I love you son”. September 11, 2001 changed that forever. My in-laws live in England and were on their way to visit my husband in the U.S. Their flight was from Manchester, England to New York, New York and was scheduled to land on 9/11/01. That morning my husband watched in terror as the days’ events unfolded on television. Because they had been here to visit him a few times prior without incident, they didn’t exchange travel and flight details with my husband, John. So John had no idea what flight they were on, whether or not theirs had been one of the hijacked planes, or where they were. Their flight was diverted to a small airport in Canada and they were made to sleep in dorm rooms on a college campus. No phone access was granted because no one knew if anyone on their flight had anything to do with the terrorist who had hijacked the other planes. It was more than 36 hours before my husband learned his mom and dad were alive and okay and that they would be allowed to continue their trip to Phoenix, Arizona in a short couple of days. Ever since that frightening day, my husband and my in-laws are closer than any family I know. They speak on the phone every weekend, come to visit us at least twice each year, and tell each other how much they love each other every time they speak. It helps ease the pain of what happened that memorable day knowing that something so profoundly good came out of the events. I hope no one else ever needs such a tragic event to make you realize how valuable our friends and family are. As a new Yorker who had just relocated to Phoenix in July 2001, this is very close to my heart. Many times I went down to the Trade Center to meet friends or to have dinner at Windows on the World. I was getting ready for work, as every other morning, and had the TV on to Good Morning America. As I was getting ready, my attention between the television and getting my kids ready to leave for school, I caught, out of the corner of my eye, the vision of the plane hitting the building. I went into my room and sat on the bed, not believing what I was seeing. As the next few minutes went by and the second plane hit, the horror was unbearable. I started making calls to NY immediately to see that my friends husbands, who worked in the Trade Center or near it, were ok, if they had heard anything. The lines were constantly busy. I decided to get the kids to school and I went to work, knowing I would keep dialing till I reached people. When I got to work, and many of us were transplanted with our company from New York, it was very somber. When we found out about the Pentagon and the passengers taking down the plane before it hit the Capitol, we all knew we had to pick up our kids and be home with them. For the rest of the day, we all just huddled around the TV and watched in horror. I did speak to my friends and thankfully all their families were safe, but were witness to the horror that was going on in the city. Unfortunately, one friend of mine had a brother who was on the plane that the passengers took down. I didn’t know this until a few days later, but he apparently called her from the plane. I can’t even believe the horror of that, but I am proud of my city and every year I go back to visit and pay homage. I am really looking forward to going back this year to see the memorial and museum with my children. Exactly one week before the terror attack on the World Trade Center, Pentagon, and attempted attack of the plane heading to the White House, I was on leave from the military and went to visit New York’s Rockefellar Square for the first time. I had been to New York before, but never had the opportunity to see the Twin Towers, Central Park, etc.. I left back to Fort Bragg that day saying how wonderful a time it was to see this Mega Metropolis. Then the following Tuesday, 11 September 2001. I was still on my 30 day leave, but somehow I woke up early that morning. I turned on the Morning show and Tower 1 had been hit. I watched in utter amazement and felt sorry for what I felt was one of them horrendous accidents since the Hindenburg explosion. As I watched, 15 to 20 minutes later, I saw it, the second plane inbound to Tower II. Immediately I phoned my unit to let them know what was going on. I asked my Company Commander if I should cancel my leave and get back to base, as I was living off-base at the time, and he told me not to until we have movement orders. As I hung up, I started to put my A-bag together in anticipation of a full alert being called. My fiance, at the time was worried that I would be heading to war. The thought was well within me that we needed to strike back immediately and with such a vengence that noone would dare attempt another attack here. As I watched on live television, the people jumping from the crumbling infernos of purgatory itself, the rage within me deepened. I knew then that we were definetly under attack. The the word came about the Pentagon and the failed attempt to take the plane over Pennsylvania skies. I knew then that my duty as a soldier would be tested. Unfortunately, my knees needed to be operated on. I was an E-4 Squad Leader at the time we finally got orders. Our initial orders were to go to New York to assist in the recovery of Human remains. This was canceled and 10th Mountain was sent to do the job. Well time went on and we finally got out orders to go to Iraq. I had just months before finished having a knee operation but was still charted to go to Iraq, but the doctors pulled me from going. I was very upset to have to send my subordinates with out me. But 9/11 awoke the angry giant within myself and all I served with. We vowed to do whatever it took to enact payback to those who would harm the innocent. It may have taken longer than expected and the cost very high. But each of us that put on the uniform in defense of our nation understand one thing- That Freedom Is Not Free–. The lives of those who served and will serve should be honored and we must do all we can as a nation to thank our men and women of the Armed Forces. On Sept 11, 2001, I was in my backyard in Hoboken, NJ with my father. I watched the 2nd plane hit the South tower and eventually both of them fall. It is an image that is permanently stuck in my memory. The debris and dust still sits on parts of my family’s home. I assisted in the search and clean up, and what I saw during that process I will never be able to recover from. My negative feelings about the people who could do something like this to innocent people were at an all time high for many years after the attack. I have avoided going to ground zero every time I go home to visit, due to the experience still being raw, even after all these years. For the people who witnessed the attack and were a part of it, I am sure this is something that they will never forget for the rest of their life. Witnessing it first hand and working with all the other volunteers involved just showed me how strong and how proud we are to be an American. I am excited to see the memorial museum and the new tower and plan to visit in October. The people of NY, CT and NJ became one on that day, along with the rest of the nation. This fourth grader woke up to go to school, ignorant of the tragedy that had just occurred. My mom walked into my room with a solemn look on her face. She went on to tell me the details she thought my 9 year old mind could comprehend. In no way did I comprehend the extent of what had just happened or what the affect would be on the world from then on out. I proceeded to attend Mrs. Pfizinger’s class and it seemed everyone was aware that this would be a day everyone would remember. Unfortunately for our friend Katey Cobos, it was her birthday. I remember feeling sorry for her that what was supposed to be a day all about her, a damper had been placed. It is weird looking back at what I thought was going on and then to fast forward to today and know what actually happened and what that would mean for everyone involved. I had taken a trip to New York a few years before and got to see the twin towers. I am definately glad today that I had that opportunity. My heart goes out to the family and friends who lost thier loved ones. These two things are my uppermost thoughts. Where was I on September 11, 2001? Well that morning I woke up and did my daily routine like every morning, the only difference was that I decided to turn on the TV, as soon as I got up in my room. At that time the first plane had just hit I was the only one wake in my house so I ran around the house and woke everyone up and said “where under attack a plane just crashed into the twin towers.” Immediately there was a stir of emotions and we were all glued to the TV as we watched the series of events take place. After a little while we were all making phone calls making sure all of our family and friends were ok. At that time I was a sophomore in High school and a peer counselor as soon as I got to school my job started. There were a handful of students that were directly affected by what was happening, I was simply there to comfort them. Every TV was on in the school in every classroom and there were tissue boxes everywhere and people crying. Classes mostly consisted on open discussion nothing formal. Later I learned that one of my uncles was supposed to be on one of the flights that went down but at the last minute he canceled his flight. While this was going on my School had been planning a trip to go to Washington DC. Because of what had taken place the trip had to be postponed. We eventually went on the trip that year but because of what had happened many of the things we were supposed to do were off limits. 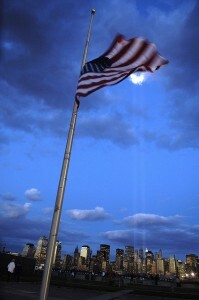 Having been so close to September 11th the mood was a bit dreary yet patriotic paying tribute to all that were lost. I remember that day so well. I woke up that morning feeling sick. As I layed in bed with my mom, my dad called and informed us of what had just happened. At nine years old I did not fully understand the extent of what that day held, but as I sat watching my mom cry and pray, I was overcome with emotions. Although I did not know exactly why it was happening, I knew that everyone would remember that day. I went shopping with my mom later that afternoon. She had to get some groceries, but the most important thing she wanted to find was an American flag to hang outside our house. We went to about four or five different stores around my small town before we found one. The rest of the day was spent watching the news and praying for every person involved. with our 2nd cousin David Silver. this wasn’t a freak accident. It was then the realization occured, my brother Adam was in that tower..
We had just spoken the day before He had played on the phone with my kids.. This wasn’t happening,we had a whole lot of healing ahead of us, we had talked about it Our family would be whole again- His wife had begun to realize that she couldn’t continue to split our family we had roads to travel and we would do it together. That day was crazy, we called my sister in law first, to see what news they had. No WORD… then they tried to create a time line, he had left late, took a different train into the city. No WORD… our eldest brother Jeffrey printed signs and went down to what would be called ground zero, talked to people who were looking for loved ones too, tried to help who he could, and kept in touch with me.. Still NO WORD. Our mother was long Long Island alone, Our father took our business van and drove slowly over the Williamsburg bridge and out of the city. He filled the van with people who were headed to the bridge and drove them home. We were in Northern NJ, our parents were on Long Island. Jeffrey was in Manhattan. Adam’s wife and two kids were on Long Island All the bridges had been shut down, the phones were the only way of contact.. and we watched the news….. and watched the news.. No one was coming out alive.the hospitals were empty. Adam’s schedule had been confimed, he was last seen on the lower concourse, he said good bye to a commuter friend who continued onto Jersey City, where he watched what happened. Adam was supposed to stop for coffee & a bagel, we thought hoped and prayed that he hadn’t had the chance to get up to the 102nd floor where he worked, that he was some how stranded below in the concourses.. or if he had made it there, had he been unaware of what happened, Vaporized by all that fuel.. the plane entered the building just below where Adam’s office was. Could he have been saved pain and suffering, the knowledge that so many others had been hurt. This is something we will never know. Months later, a call came from the medical examiner. DNA had been matched they were making a release of remains.. there ended up to be 2 of these releases. 2 additonal funerals. So it’s been 10 years, my heart still aches with empty promises that what should of been. His Children are of my heart, have grown into incredible young adults. His daughter who was 13 at the time followed his mother & father’s steps and attended Hofstra University on Long Island. His youngest Ethan is at a SUNY School upstate. They have carved out a life for themselves, they are the ultimate victims here having lost a parent who was involved, loving and knew how to show it. He was Coach of the year for his work on various teams in Plainview, NY were they lived. He was elected postumosly to the board of directors of their Jewish Center in Plainview. He was smart, funny, generous loving family man. He had a huge circle of friends who loved him, and cared for his children in the years that followed. The world changed for me that day, I no longer felt safe in large crowds, places that I think will be targets for crazies.. I still can smell the smoke of the towers, I still remember clear as daylight walking around lower manhattan as we gathered for the first memorial at Ground Zero. Feeling like I should be on the back lot of universal studios. This wasn’t real, how could it be. Stuff like this only happens in a Bruce Willis movies. I remember exactly where I was and what I was doing because my closest teammate had cousins living in NY and she was frantically trying to call everyone she knew. I was in my 5th grade social studies class with my teacher, Mr. Ambos. He kept trying to lecture about geography, but all the class could focus on was the attacks. What scared me the most was when the camera would zoom in and I would see people jumping out of the windows of the twin towers. I was devastated and shocked. I called my mom and dad to make sure they were watching. The whole school was still and quiet for the remainder of the week because September 11, 2001 was the only thing people could talk/think about. Everything anyone would say to me I would relate it to what we all just witnessed. I had another curve ball thrown at me when I met my ex-boyfriend who was from NY. The first thing I asked him was if he had any family members that got killed in the accident or if he knew any friends and family, and fortunately, everyone he knew was located on the first 5 levels. It will definitely be a day that I will never forget. I had just dropped my son off at preschool and was walking to bible study to meet up with friends. The TV was on and right there before my eyes I watched the footage. My heart dropped into my stomach. My heart went out to all the people involved: the employees rushing for their lives, losing their lives, the emergency rescue workers, the families whose lives would change forever. The nice thing about being at bible study is praying with other believers. Praying without ceasing. My husband was to start a job the next day, and oddly enough the home office of the company was across the street from the twin towers. He was supposed to fly to NY to meet with the head of the company, instead he was attending memorial services for agents he knew who died that day. My friend was supposed to be on one of those flights, but the Holy Spirit prevented it. She is alive today, but many of her colleagues are not. 9/11 would change the world in so many different ways. I am grateful for my freedom, but I will never take it for granted again, nor will I keep a false sense of security. Hi. I am an online math teacher. I worked across the street from the World Trade Center ten years ago and watched the events unfold from half a block away. I saw and heard things that television never really captured. I still work right across the street, although in a different building. The construction, the tourists, the people selling souvenirs have all been a part of my life every day. I lost one acquaintance and one son of a friend that day. Now there is a new terrorist threat. Each year on 9/11 I have tried to get as close to where I was on 9/11/01, to remember. The Mayor has said not to change our routines, and so unless he closes the public transportation, I will be in the same spot this Sunday. I am thankful to have survived it ten years ago, and I will not yield to potential terrorists this year. My life changed that day in so many ways, I had to say no, goodbye and how do I carry on. Ten years have gone by in a blink, I am still saying goodbye, and still asking why. I was in Columbia, Maryland on September 11, 2001. I was getting ready to go the the VA Medical Center in Baltimore. I was in the doorway of my dining room when the call came from my doctor telling me that the VA was on lock down and not to come in for my appointment. I ask why, I was told to turn on the TV and I would find out. When I turned on the TV I saw the North tower on fire, then only minutes later I saw another plane hit the South tower. I was in shock as I watched the horror unfold before me. When the plane hit the Pentagon I could not help but think of my friends that worked there and praying that they would survive. When flight 93 went down in PA and the details come to light that the passengers had taken control of the plane before it crashed I could not help but to feel sorrow and joy that these men and women had fought back. I did not know what I was feeling at time, but I do know that my life had changed that day. Having served in the military, having friends that are first responder, and the countless lives lost that day, and in the years to come, I made a decision to work with victims of trauma. It is my hope that as I help others, that I to will heal from the trauma that our nation suffered that day. I know for me the memory men, women and children who died that day gives me the courage to stand up for what I believe in and to honor their sacrifice I will continue to remember. As it was said on flight 93 “Let roll” for a safer nation and world. Going on. When my mom came in and said boys you need to come with me, i had no idea what was about to happen. I was scared. My mom began to tell me how bad people decided to fly a plane into a building. That was about the time that i looked at the screen and saw the second plane hit tower 2. After seeing all of that SHOCK just kept unfolding before me. Here we are ten years later. I enlisted into the Army knowing that i will be fighting aginst the people that tried to ruin our country. I have seen stuff most people shouldent ever see, done things, and been a part of things that have kept our country free. Took out the target, Engaged the enemy, and continue to fight no matter what. I pray every day for the men and women that lost their lives that tragic day. They had no idea that it was coming. Thank you to the heros that got people out of the buildings. I also now know what it is like to fight to keep this country free. What it is like to loose a brother or sister in arms.